There are always piles of books in my house. A certain subject matter catches a family member’s interest, and all of the books on the relevant subject are ripped from our library upstairs and strewn across an ottoman, the couch, or the table. Research is committed in a frenzy. At the end of the day, the only thing one can do against the onslaught of such an encouraging mess is pile the abandoned research materials neatly and wait for the erstwhile scholar to return to it the next day. On my book stand right now are some of our books on herbs. My plan was to wait until fall to start the planning of the herb garden... but I find I just can't wait. Most of these books have been occupying real estate on my shelves for years, waiting until I had the space (and enough years in the same place ahead of me) to contemplate actually planting the garden I’ve dreamed of. Oh my… visions of dried herbs hanging in huge bunches from my rafters, scenting the air all winter, of rows of jars full of lotions and salves, vinegars and tinctures. Perfumed oils, soaps. Spinning wool dyed with things grown by my own hands. These very thoughts have caused me wistful sighs for almost a decade. Now I am so close. We’ve had this discussion about my tendency towards hubris, yes? I decided that I could not possibly start planning without a complete inventory of the herbs I wanted to plant. Truthfully this is possibly one of my silliest notions to date, but sure, why not, let’s roll with it. I will say this, when my husband was presented with a partial list of the species I dreamily envisioned populating neat raised beds and running wildly into each other in the larger back beds (like miniature wild fields) he raised an eyebrow and stopped telling me that it was too much space. I started in the kitchen cabinets, thinking not unreasonably that a good place to begin was by looking at the herbs and spices we already use. Then the tea cabinet. I had already received a pot of stinging nettles as a house warming present from a like-minded friend. “Nettle tea,” I explained to my other guests, “is MARVELOUS.” A host of other plants from that area of the kitchen joined the list; chamomile, peppermint, dandelion, licorice, purple coneflower, red clover, spearmint, the list went on. Then it was upstairs to the first aid supplies. Arnica, and witch hazel joined the list. Then I started to add those herbs I had always wanted to grow – lavender, and feverfew, and roses OH MY! And that, well, that my friends is where I started to come off the tracks. That is when the books came down out of their lofty library and started taking up space beside my chair. Because after all, I wouldn’t want to miss ANY potentially useful variety. “What do you mean I don’t suffer from gout? You never know.” 48 species in the farm journal later, and not a dye or perfume specific plant in sight, I realized I had a problem. 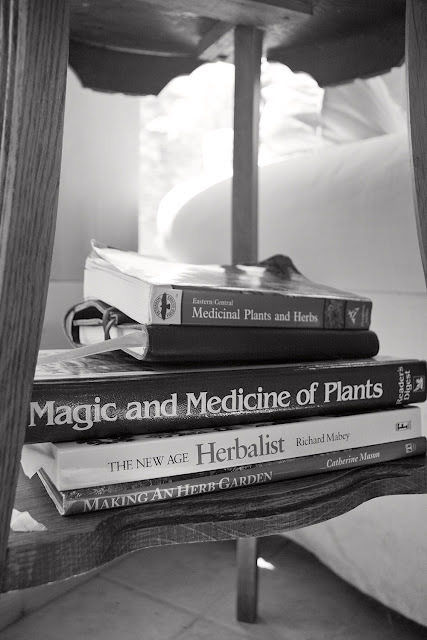 I had herbs written down that I had not clue-one about growing or using. They had just sounded so terribly useful. But visions of spending my late winter armpit deep in plant starters full of things I might not even use sobered me up quickly. Time to back up the crazy train. Once again, I realize that my efforts here must be practical as well as beautiful, and that I cannot afford to spend my time dreaming. I have dreamed my whole life on my way to this place, and now it is time to act. Planning and research before planting are still necessary, but I have to be careful not to fall into the old habit of dreaming about the possibilities in lieu of building in the present. "He who reads and reads and does not what he knows, is he how plows and plows and never sows."